Please note: In 2018, we don’t organise the Ecosummit Award as the added value of the award is very small for the success of our conference. Go to Ecosummit Market to create or update your startup profile and apply for ECO17 Award. 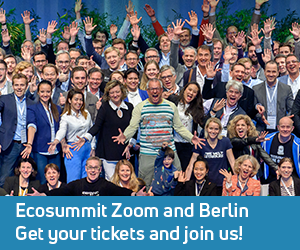 Ecosummit Award 2017 is part of our flagship event Ecosummit Berlin 2017 on 9-10 May 2017 and brings publicity and prize money to the most promising smart green startups that enjoy fast growth and high chances for a successful exit. The ECO17 Award jury consists of investors and corporates that are actively looking for new investment and open innovation opportunities. The ECO17 Award rewards the 3 best startups in 2 categories: Early Stage Startup (< €2M revenues 2016) and Late Stage Startup (> €2M revenues 2016). To apply for ECO17 Award, please create a public startup profile on Ecosummit Market. After completing your startup profile click on “Apply for Ecosummit Award 2017” to notify our team. The application period for ECO17 Award ends on Monday, 24 April 2017. The online jury voting takes place from 25 April until 2 May 2017. 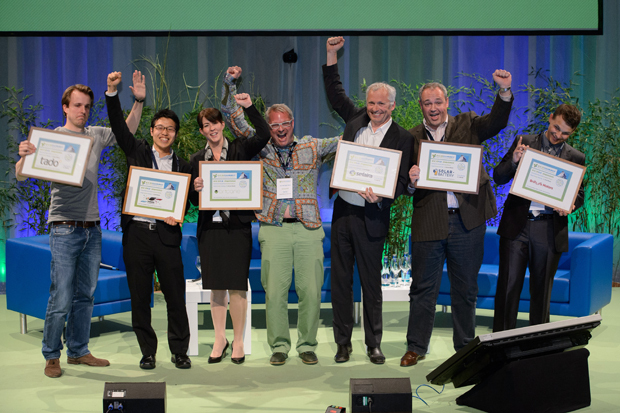 Past Ecosummit Award winners won’t be nominated again as we want to promote new startups. Please note that we won’t nominate corporate startups that are majority-owned by corporates. We are assembling a fantastic ECO17 Award jury focusing on smart green investors (angels, accelerators, VCs and impact investors) and corporates. Casting their votes, the judges assess growth potential (product market fit, revenues and international competitiveness), product innovation and environmental impact. €1.500, €1.000 and €500 plus 2 ECO17 Berlin tickets go to the best 3 startups in the Early Stage Startup and Late Stage Startup categories that convince the jury and collect the most points during the online jury voting from 25 April until 2 May 2017. Per vote the Gold candidate gets 3 points, the Silver candidate gets 2 points and the Bronze candidate gets 1 point. The winners of the ECO17 Award will be announced at ECO17 Berlin on Tuesday, 9 May 2017. ECO17 Award applications are accepted until Monday, 24 April 2017. You should only apply for the ECO17 Award if you are a smart green startup that develops an innovative product with promising growth potential and positive environmental impact. To get nominated you should have reached several milestones such as company foundation, experienced management team, advanced product development, backing from angels, accelerators or VCs, strategic partners, promising customer feedback or revenues. Please note: Past winners of Ecosummit Award won’t be nominated again as we want to find and promote 6 new winners in 2017. To apply for the ECO17 Award, first we invite you to create a public startup profile on Ecosummit Market. Once your profile is complete, you can apply by clicking on “Apply for Ecosummit Award 2017” directly on your profile. The more information you publish on your profile, the easier it is for the judges to evaluate your growth potential, product innovation and environmental impact. We want to benefit from the intelligence and reach of our community and appreciate your help with spreading the word and motivating smart green startups to apply for Ecosummit Award 2017. In the evening of the first ECO17 Berlin conference day, Tuesday, 9 May 2017, we will celebrate the big ECO17 Award party at the fantastic Radialsystem. You may expect a cool award ceremony, healthy dinner buffet, delicious drinks and groovy music. 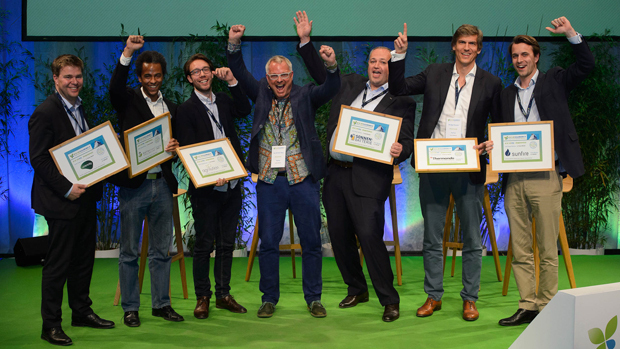 58 smart green startups were nominated and the winners of the ECO16 Berlin Award are Kiwigrid, Mobisol, Kebony, Lumenaza, BEN Energy and Electrochaea. 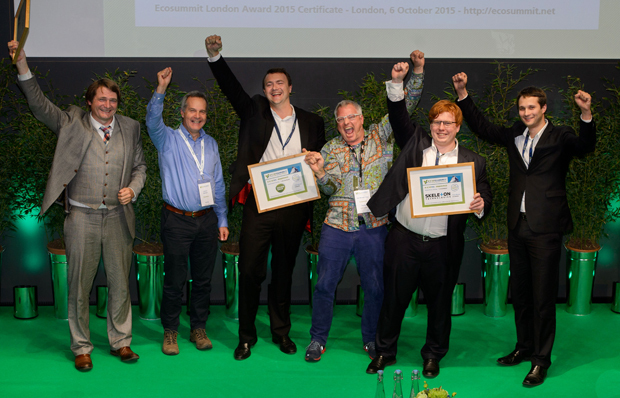 37 smart green startups were nominated and the winners of the ECO15 London Award are Skeleton Technologies, Solarkiosk and Grundgrün. 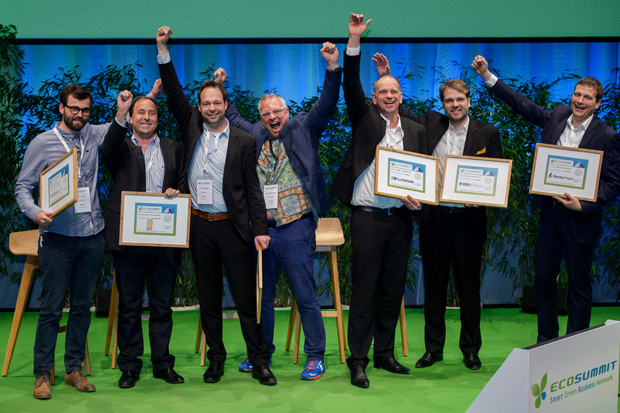 83 smart green startups were nominated and the winners of the ECO15 Berlin Award are Sonnenbatterie, Sunfire, Thermondo, Agrilution, Ubtricity and Bettervest. 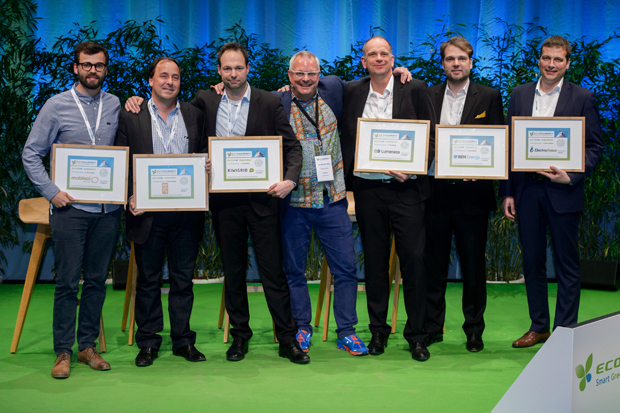 49 smart green startups were nominated and the winners of Ecosummit Award 2014 are Sonnenbatterie, Sunfire and Orcan Energy. 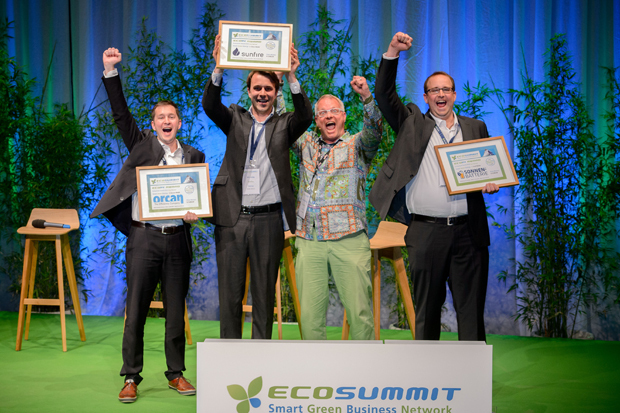 43 smart green startups were nominated and the winners of Ecosummit Award 2013 are Sefaira, Tado, Sonnenbatterie, Pirika, Bravo Motors and Oricane. 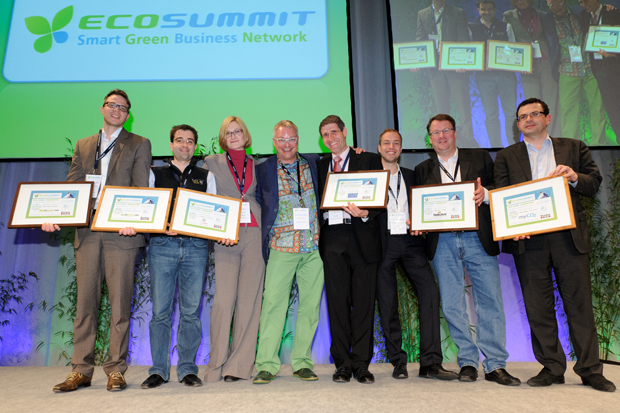 52 smart green startups were nominated and the winners of Ecosummit Award 2012 are Smart Hydro Power, Heliatek and Carpooling.com.